New Series I'm starting called "What I'm Teaching." I know it won't interest all my readers, especially the ones who just want Grace and Josiah! But hopefully will be interesting to some. I've taught "Firm Foundations: Creation to Christ" to sixth graders at HOPAC for 3 years. I also taught the same curriculum to 5th graders during our first term. I first heard this curriculum taught by my mom when I was helping at a Saturday Kids' Club when I was in high school. I was dumbfounded. I was a teenager, had been to Sunday School and Christian School my whole life, and I was learning things right along with the kids! The best thing about this curriculum is that it seeks to give continuity to all of Scripture. It's not just a series of stories; it shows how the Bible is a story: one story that is totally connected. Did you know that God put in a promise for the Messiah when he cursed Satan in Genesis 3? Do you know how the 10 Commandments and the Tabernacle relate to Jesus and our lives? Have you heard about all the echoes of Jesus throughout the Old Testament? Hopefully you have. But children are often taught the Bible (especially the OT) as a series of disconnected stories that have a moral meaning. This curriculum is published by New Tribes Mission, an organization that serves tribal people in very isolated settings. They found that they couldn't just go in and "share the gospel" with people who had no concept of who God is and who had never heard of a Bible. They realized that they had to start at the beginning. What's interesting is that most of the people in the world today fit into the same category--no longer do people, even from "Christian" nations, have any pre-conception about what the Bible teaches. Thus, I believe that teaching this series is one of the best ways to share the gospel with anyone--from any country, from any background. Most of our co-workers here in Tanzania are using the adult version of this curriculum with the people they are trying to reach. 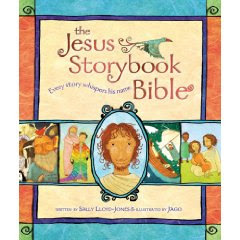 I found this fantastic Bible storybook that has the same concept: showing how all the stories in the Bible are really just foreshadows of Jesus. It is very well-written, entertaining, creative, and has beautiful illustrations. We've been reading through it with Grace, and it's a little over her head, but she still loves it. Highly recommended! Ah, the second child syndrome. But I want you to get to know my quirky, funny, affectionate little guy. He really has quite the throwing arm. While he was sitting in the hammock on our porch, grading papers, Gil said, "I feel like I'm on vacation, but I just have to work." Ahhh...yes. Despite the fact we still have barely any running water in the house (they are working on it), everything is just. so. lovely. I'm in a new house. Unless you've been following this blog pretty carefully, you probably don't know why. So here goes. We loved the house we were living in. It was a perfect size, great yard, excellent for youth group, good location. It just had one small flaw: the walls were falling down. Sort of. All of the internal walls had these gigantic cracks running through them. Cement walls. With cracks so big that sometimes you could see all the way through to the room on the other side. And they kept getting bigger--sometimes by the week. So the landlord sent over a contractor who checked it all out. He thought the best solution would be to knock down all the internal walls, put a better foundation under them, and then rebuild them again. They wanted to do this last summer. Considering we had guests for the entire summer, we asked the landlord to put off the work until March, when we would be going on our Home Assignment. She agreed. In the meantime, the contractor reinforced the walls and fixed the cracks. Since then (a year ago), there have been no more cracks. But....the landlord still wants the walls rebuilt. Even though we've had two of our own contractor-friends examine the house and tell us they thought that would be a waste of money. Nope. Landlord won't be dissauded. The walls are coming down. Only problem is that now we couldn't take our Home Assignment in March. Which means we had to find another place to live. Finding short term housing is not easy. Twice I even asked the landlord if we could stay in the house while the work is being done. (What was I smoking? They are going to knock down all the internal cement walls and I still want to live there with two toddlers? Yeah...) But there were times I felt desperate enough to do it. Thankfully, she said no. As of last Wednesday, we thought we had a place to move to. I had been emailing with the landlord and I thought everything was set. So I called him on Wednesday. "We want to move in on Saturday. Can I bring the check at the same time?" "Oh," he tells me. "I need you to pay in cash. If you want to pay by check, you have to add on another 20%." What the....? Oh. Suddenly I get it. 20% is the amount of government tax. Cash. I see. Uh, I don't think so. No, I'm not going to pay another 20% on your already over-priced two-bedroom apartment. And no, I'm not going to pay you under the table either. I was infuriated, to say the least. And now we had no place to go. So we prayed. And suddenly a thought came to me. What about the house on the hill? Sigh. The house on the hill. Our dream house. We had looked at it four years ago and it was way too expensive to rent. But it's right next to school. Overlooks the ocean. Amazing breeze. Feels like a beach-vacation house. And we knew it was empty right now. A new owner had just bought it. Hmmm... It will probably still be too expensive, but it was worth a shot. We got ahold of him on Thursday. He came down in his asking price because we only wanted it for a few months. We went up in what we were willing to pay because we only wanted it for a few months. We met in the middle. We met with him Monday to make sure. We were sure. He was sure. Tuesday was a holiday (Mohammed's birthday--did you know that?) so it was a good day to move. We could never have done it without Carley, Julie, Savannah, Melissa, Hannah, Caleb, Ben, Sarthak, Esta, Tumaini, Gibbie, Cecilie, and Sarthak's mom, who made us lunch. It poured rain on Tuesday and the truck we checked out from school wasn't there, but another friend came with his truck at the last minute. I hate moving. Especially knowing that I will have to do it all over again in three months. But I am so thankful for friends. So. We are exhausted but thankful. Thankful for God's wonderful provision and undeserved blessings. 16 months old. Finally fits into his 12 month clothes. He has stolen my heart. He really is obsessed with balls. All day long, he hits them, throws them, and kicks them, and he's happy. I really think it fulfills a lifetime dream of mine to dress my little boy in OshKosh overalls. I mean, really. Is there anything cuter? He's often pretty solemn, but many times during the day, he'll look over at me. I'll smile at him, and this is what I get in return. Too many things swirling around my mind. Grace's U.S. immigrant visa interview this morning...did I ever realize what a complicated procedure this is? Just because she's adopted by Americans doesn't automatically make her American. Josiah's homestudy appointment this afternoon. Josiah's court hearing on April 17th. Moving out on Saturday. Yep, moving out. It's happening. The landlord is bound and determined to knock down all our internal walls and build them again. Can't be disuaded. So, we're moving. To short-term housing that is way too expensive but we don't really have a choice. He says 1-2 months...we're doubling that and hoping it's not even longer. And then there's all the bad news. Aren't you getting it too? Too many people losing jobs...too many people I love who are struggling. What's next? And I'm guessing the worst is yet to come...and afraid to open my news page every day. These are uncertain times. But is anything ever certain? He is good, and He is in control.